Mimas, one of Saturn's moons, seems to be on a collision course with the planet's rings. No fear though, it's simply an illusion in this image snapped by NASA's Cassini spacecraft. Collision course! … or not. 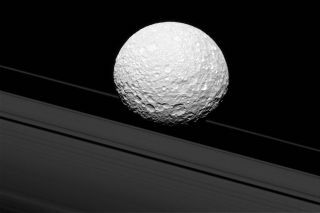 Saturn's battered moon Mimas appears to be headed for a crash through the planet's trademark rings, but it's all an optical illusion seen by NASA's Cassini spacecraft. While it looks as if Mimas is about to smash into Saturn's rings, the moon is actually 28,000 miles (45,000 kilometers) away. "There is a strong connection between the icy moon and Saturn's rings, though," NASA officials wrote in a description of the image, which the agency released Monday (Dec. 19). "Gravity links them together and shapes the way they both move." This image, taken on Oct. 23, with a green filter from Cassini spacecraft's narrow-angle camera from a distance of 114,000 miles (183,000 kilometers), looks toward the anti-Saturn hemisphere of Mimas. The scale is 3,300 feet (1 kilometer) per pixel. Launched in 1997, the Cassini mission is a cooperative project of NASA and the European and Italian space agencies. In addition to NASA's Cassini spacecraft, the mission also sent ESA's Huygens probe to Saturn's largest moon, Titan, in January 2005. Cassini has collected amazing amounts of data about the Saturn (and its rings and moons) over the years. The spacecraft began the grand finale of its mission at the end of 2016, and will eventually end its mission with a death dive into Saturn itself on Sept. 15, 2017. Follow us @Spacedotcom, Facebook or Google+. Original story posted on Space.com.